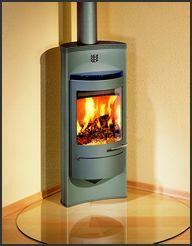 Decorative and free-standing stoves are capable of providing both space and water heating. Although the fire is contained behind doors, on some models they can be opened while the fire is alight to allow the warmth and glow of a real fire to complement the room. The doors should be closed when a more efficient slow burn is required or when the room is unattended. Attractive yet practical stoves are available with boilers, ranging from those with a small output for supplying domestic hot water only to the large output units capable of heating radiators and domestic hot water. Many stoves can burn wood or logs, however, a far greater heat and better performance is obtained when using either coal or smokeless fuel. or telephone our local call rate Helpline 01773 835400. Sales of solid fuel stoves have soared over recent years. Aside from the practical advantages of solid fuel, a stove makes a fashionable addition to the modern home and no other heating system can match the “wow” factor or the cosy sense of comfort and well-being that an open fire or stove lends to a room. To many people, the cosy glow and flickering flames are part of what makes a house into a home. 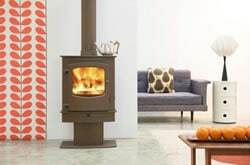 The vast majority of the so-called “woodburning stoves” installed should be more properly referred to as “multifuel” stoves and it is this type rather than the wood-only stove that has experienced the greatest increase in popularity. The main advantage of a multifuel stove is that it can burn a range of solid fuels as well as wood. This gives the user the added convenience offered by mineral fuels and the flexibility of being able to select fuel according to price and availability. Low running costs - Solid fuel is an efficient and economical method of heating. According to the Sutherland comparative heating tables, the cost of central heating with anthracite has been consistently lower than both oil and LPG and is actually on a par with natural gas. Moreover, the solid fuel roomheater is reckoned to be the most cost effective method of space heating. Health - Solid fuel heating can greatly reduce condensation, eliminating household mould. Medical research has also suggested in the past that solid fuel heating can reduce the risk of hay fever, asthma and eczema. Homes with solid fuel heating are better ventilated than those with other forms of heating because the chimney causes fresh air to be drawn in and evacuates the stale air. Availability - Solid fuel users in almost all areas enjoy the benefits of a well-developed and regulated distribution system via local members of the Approved Coal Merchants Scheme. As the UK still has enormous reserves of coal, future supplies are assured. Supplies of firewood are also set to increase in line with the increased demand from multifuel stoves. Convenience - The frequency of refueling and the quantity of wood needed to maintain adequate heat output can be underestimated by newcomers to wood burning. Fortunately, the calorific value of a mineral fuel such as anthracite is around four times that of wood and its heat output is more sustained. Therefore, the mutifuel stove can provide the “best of both worlds” by allowing the wood burning enthusiast to also enjoy the practical benefits of coal when required such as reduced frequency of refueling and even overnight burning. Security of supply - solid fuel stove owners can feel secure in the knowledge that if they have fuel in stock, they will always be able to keep warm and cosy. Indeed, with a flat topped stove, a kettle of boiling water is only a few moments away! Moreover, in an uncertain world, investment in solid fuel heating can provide an insurance policy against the threat of future gas and power cuts or the volatile price fluctuations of other domestic fuels. Choice and flexibility –In smoke control areas, smokeless solid fuels such as anthracite can still be burnt and even seasoned firewood can be used if the appliance is one of the DEFRA exempted models. CO2 - Those users concerned about CO2 emissions may be surprised to learn that a stove burning a 50:50 mix of wood and coal can have a smaller carbon footprint than a typical gas boiler. For information about re-fueling your wood burner visit our LITERATURE page and download our informative brochure.